This email is only sent to subscribers. To subscribe or unsubscribe to this or our other email lists, email subscribePath@gmail.com, indicating subscribe or unsubscribe with the name of the email list. Our email lists are described here. This 20-hour workshop is designed to address the activities and issues faced by the surgical pathologist. The 24th Annual Surgical Pathology Workshop consists of short lectures and case-oriented discussions. Microscopes will be available. Participants will be asked to examine microscopic images and formulate a diagnosis and patient management strategy. The faculty pathologist will then discuss the diagnosis, differential diagnosis, patient management, and other pertinent features. Cases will be selected to represent common and/or difficult diagnostic problems. This workshop will be held at The Canyons in Park City, Utah. Bring the family and have an incredible winter getaway! Click here for more information. (1) We are updating the staging sections of all of our chapters based on AJCC Cancer Staging Manual (7th ed). (2) Visit us at USCAP in Washington, D.C., booth #1303. We are proud to be a sponsor of USCAP, specifically of the Speaker Preview Room. Stop by our booth and let us know how we can make PathologyOutlines.com more useful to you. Thanks to Dr. Karen Fritchie, University of North Carolina at Chapel Hill (USA), for contributing this case. To contribute a Case of the Week, follow the guidelines on our Case of the Week page. A 4 month old child was found to have a midline skull lesion. She was the product of an uneventful pregnancy, and she had no other medical issues. The lesion was excised. This uncommon, rapidly growing mesenchymal tumor typically occurs in the bones of the jaw or skull in infants in their first year of life (eMedicine). It is a biphasic tumor with tubular or alveolar patterns. It consists of large melanin-containing cells with abundant cytoplasm and pale nuclei, surrounding nests of smaller neuroblast-like cells possessing scant or fibrillar cytoplasm. There is usually minimal mitotic activity, and no atypia. The large cells are immunoreactive for keratin and HMB45. The smaller cells are usually immunoreactive for CD57/Leu7 and NSE. 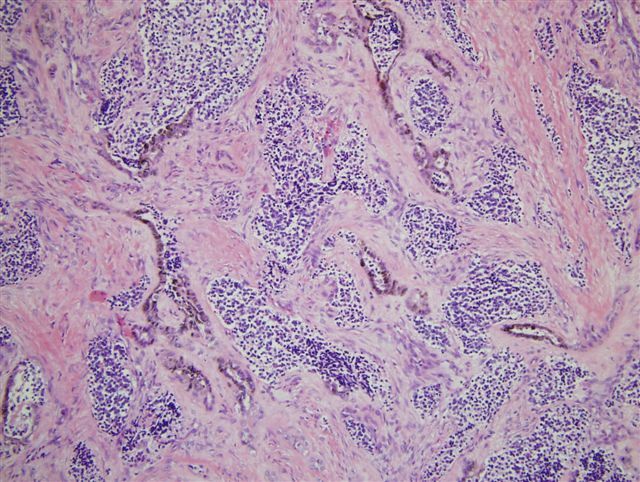 Although the tumor is of neuroectodermal origin, both cell types are usually negative for S100 (Am J Surg Pathol 1993;17:566). Ultrastructurally, the pigmented cells contain melanosomes, and the neuroblast-like cells contain neurosecretory granules and cytoplasmic processes. Pigmented neuroectodermal tumor of infancy was historically called melanotic progonoma or retinal anlage tumor based on the suspected cell of origin. In 1966, Borello and Gorelin reported a patient with this tumor and high urinary excretion of vanilmandelic acid, suggesting a neuroectodermal origin (Cancer 1966;19:196), which has subsequently been confirmed. The differential diagnosis includes neuroblastoma and other small round blue cell tumors, as well as melanoma. 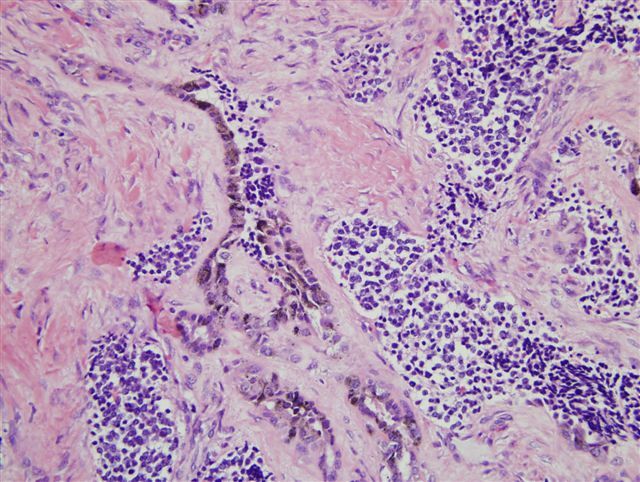 These malignant tumors typically lack the clinical presentation of a jaw or skull tumor in infants, exhibit prominent necrosis, atypia and mitotic figures, and lack the biphasic pattern of pigmented neuroectodermal tumor of infancy. Treatment is excision with negative margins. Recurrence has been reported in 37% of cases, with metastases in 7%, although no prognostic factors have been identified (Fetal Pediatr Pathol 2006;25:59).